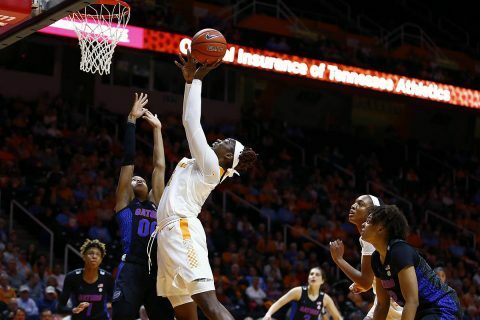 Knoxville, TN – Sophomore Rennia Davis and redshirt senior forward Cheridene Green each posted double-doubles to propel the Tennessee Lady Vols to victory over Florida on Thursday night in Thompson-Boling Arena, 67-50. The Tennessee Lady Vols shot 45 percent from the floor, and nine players scored on the night. UT controlled the battle inside, out-rebounding Florida, 48-32, and held a 28-22 scoring advantage in the paint. Tennessee’s defense complimented its tough play inside, holding UF to 29 percent (19-66) from the field. It was the second-lowest field goal percentage allowed all season by the Big Orange. Tennessee out-rebounded UF 8-4 in the first 5:26 of the game and set the tone inside early on the Gators, as sophomore center Kasiyahna Kushkituah and Green collected five of the team’s first eight rebounds. The duo finished the contest with a combined 21 points and 16 boards. The Tennessee Lady Vols forced the Gators into a scoring drought of 2:01 in the first quarter and held a 15-4 advantage at the 3:07 mark of the first period. Tennessee went on a 9-4 run to end the quarter, knocking down all of its three-point attempts in the frame (3-of-3). Evina Westbrook dropped in two consecutive triples, giving the Lady Vols a 21-6 advantage at the 1:32 mark in the first period. Cheridene Green controlled the pace for the Tennessee Lady Vols in the final quarter, as she tallied six points and five rebounds. Tennessee outscored the Gators 15-14 and never led by less than 13 points. UT held UF to just eight points in the first period, tying UNCA’s eight first-quarter points as the lowest first-quarter point total by an opponent this season. Tennessee rode 56.3% shooting from the field and a went a perfect 3-of-3 from behind the arc en route to a 16-point lead by the end of the opening stanza. That marked UT’s largest first quarter lead since leading by 24 (34-10) against Florida A&M on Nov. 18. Evina Westbrook now has 12 games with five or more assists and is averaging 5.1 apg on the season. Rennia Davis bounced back from a four-game single-digit scoring slump to lead Tennessee offensively in back-to-back games, scoring 24 against LSU and 19 vs. Florida. It marks the first time she has ever led UT in scoring in consecutive games. Rennia Davis has now logged a total of 18 games with 10 or more rebounds, becoming just the second Lady Vol to reach that achievement as an underclassman since the turn of the century. The only other UT sophomore to amass more games with 10+ rebounds since the year 2000 was Candace Parker who tallied 33 by the end of her redshirt sophomore season. Tennessee out-rebounded Florida, 48-32, and is averaging 46.0 rpg in SEC play while holding opponents to an average of 35.5 rpg. UT has now outworked 18 of 21 opponents on the glass this season. The Tennessee Lady Vols return to the road, traveling to in-state rival Vanderbilt for a 3:00pm ET (2:00pm CT) matchup on Sunday, February 3rd. The game will be televised by ESPN2.